Most organizations over time have invested in several standalone point solutions that address different areas of need. The largest and most successful companies go beyond point solutions by creating a unified construction management software solution, either through extensive integration of best-of-breed technologies, or standardization on a single technology platform. 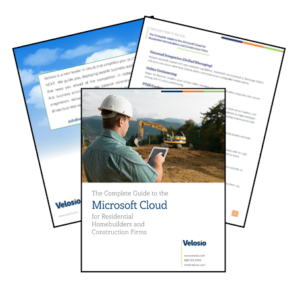 In this paper we detail the business value of platform adoption, examine the specific needs of Residential Homebuilders and Construction Firms, review the elements of the Microsoft Cloud, and illustrate why the Microsoft Cloud should be a serious consideration for anyone in the home building or construction space.